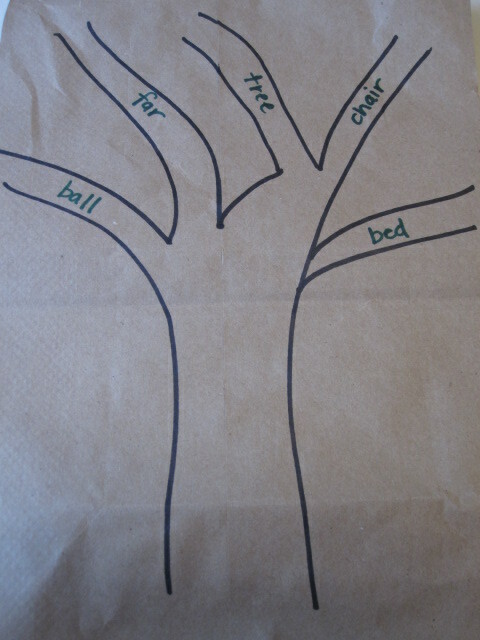 My son is all about games and challenges and this rhyming tree was just the right amount of learning ( and fun) after a long day at preschool. 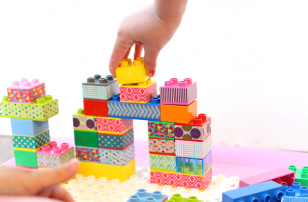 Whether you homeschool or just add little bits of learning into a day full of errands and play remember that lessons don’t have to be long, they just need to be targeted. 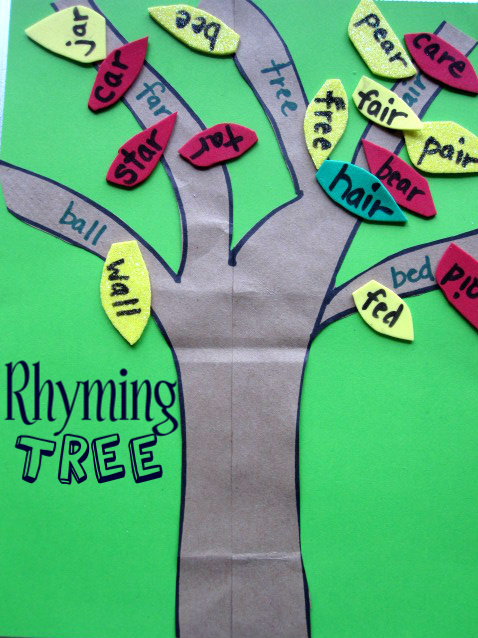 This morning as I nursed my daughter my son and I played with rhymes so when he got home I had this tree prepped for him to revisit the rhymes and some new ones too. Gather your materials. You will need some sticky back foam( I used up lots of scrap pieces finally), construction paper ( I also used part of a paper bag… I love reusing things), markers , scissor and a glue stick. 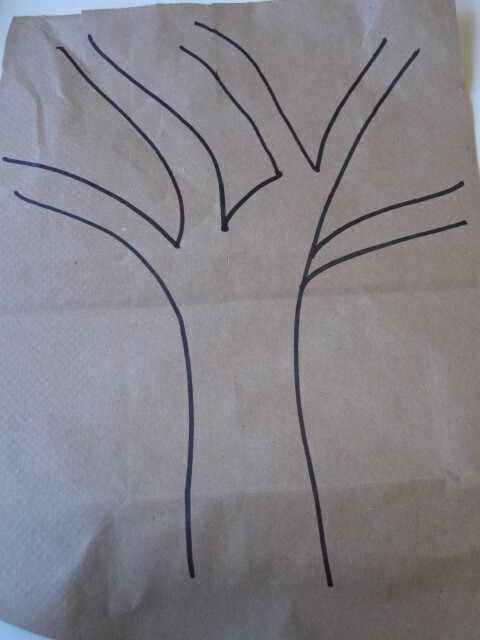 Start by drawing a tree without leaves. 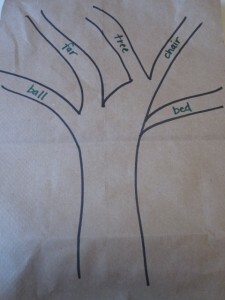 Write one word on each branch. 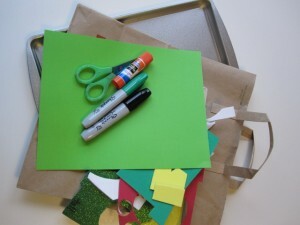 Cut out and glue on the construction paper. 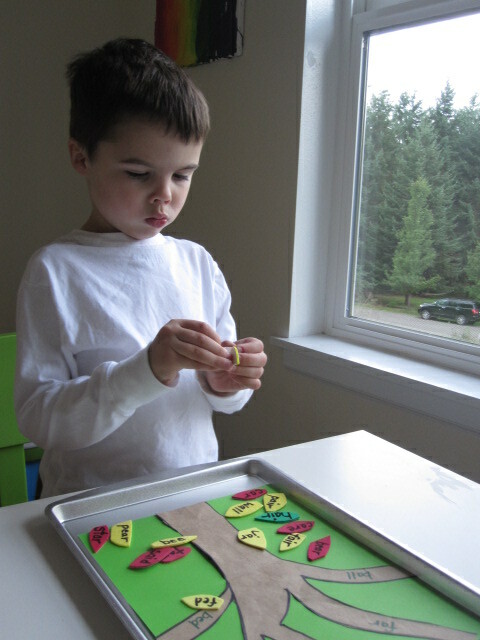 Write rhyming words on the foam and cut out in the shape of leaves. 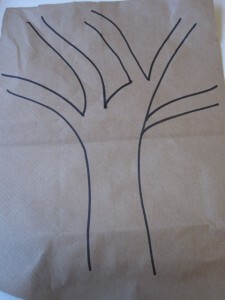 Glue the tree on the paper. Add one rhyming fool . 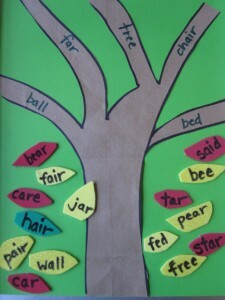 Peel and stick the words onto the rhyming branches. This isn’t a quiet time activity because I added some words to spark discussion like pair and pear as well as said which he recognizes in books but I suspected ( correctly) that out of context he doesn’t recognize. So even a little lesson( or game as my son calls it) like this can let me talk about homonyms and check on his sight words stress free. He loved it and laughed hysterically at me when I asked if I could add one becuase I was SURE that chair and bee rhymed. Another reason to stay and play… giggles! When we were done he counted up all the words on each branch to see which branch won. Yay a little math too ! 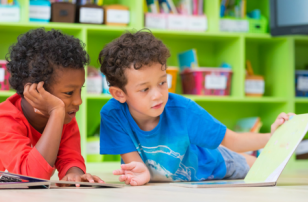 The best part about learning to read are these games and play that becomes possible so don’t forget to make words a game…even if there is a lesson or two hidden inside. Love this! I think my son will enjoy it too! As always, thanks for sharing your creative ideas! I would love to hear more about how you’ve been teaching your son to read. 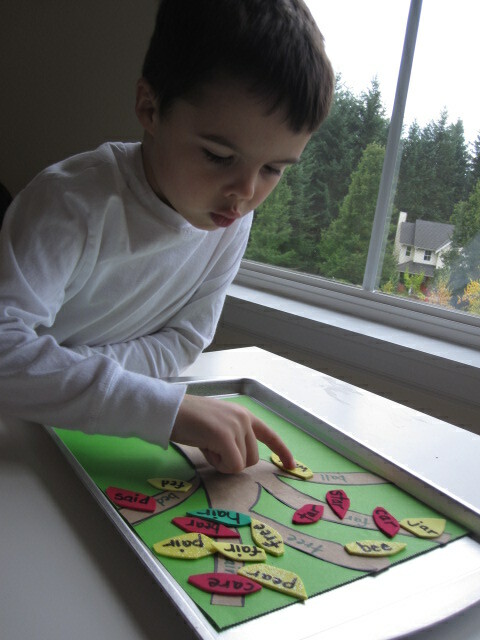 fun/engaging sight word introduction and practice ideas are eluding me! 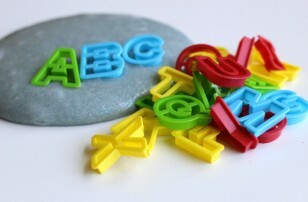 you never realize how much of our language is non-phonetic until you try to teach a kid to read! 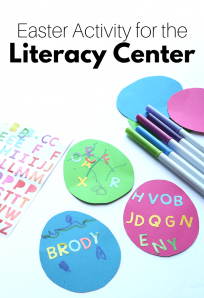 Also if you are on pinterest I have a board on there called “Early Literacy” and often pin sight word and other teaching your child to read resources! i love how you use a cookie sheet to do crafts and projects on. Great Idea! 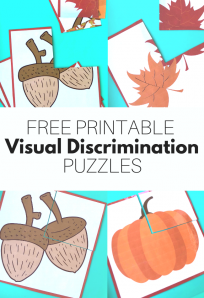 This is a great idea to teach sight words and celebrate the coming fall. Just came across your blog today! LOVE it!! I will certainly be back and really appreciate all your ideas! 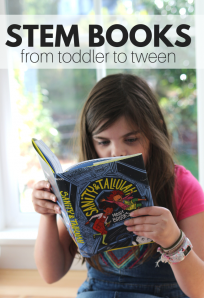 I stay at home (most of the time) with my 3 yr old and 17 mo old and have been looking for a resource like this! You have so much fun learning at your house. I like this. My son isn’t old enough to read, but I will keep this activity in mind for when he does learn to read. 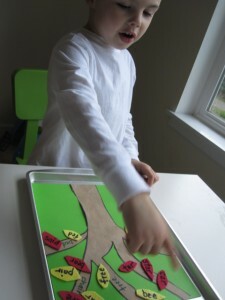 I really think this would serve as an excellent learning tool for my son. Thank you for the post. Great site. Love it. 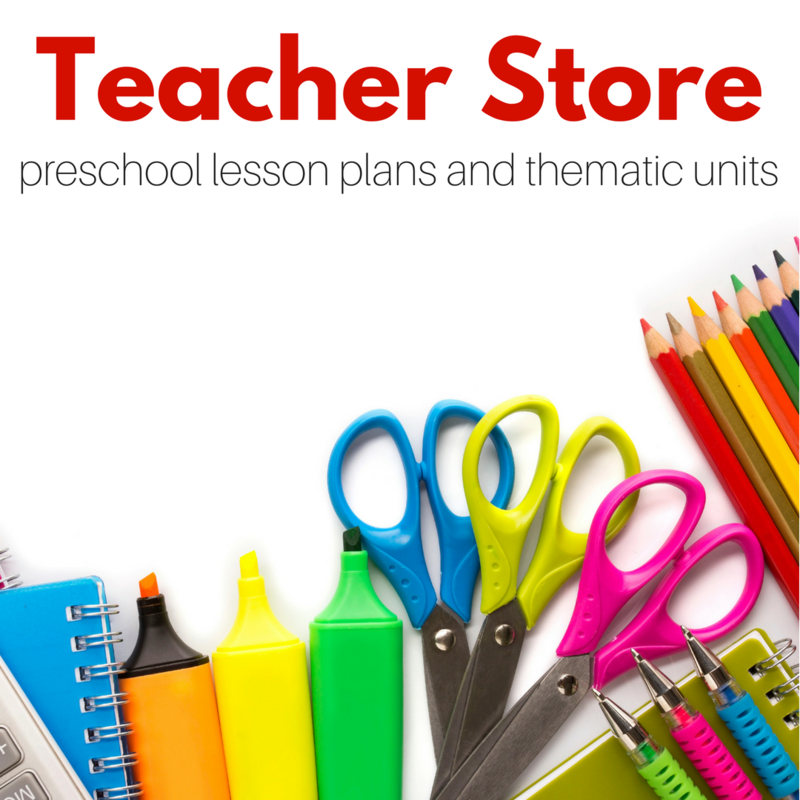 I am preschool teacher and the ideas are wonderful.